Lauren M. Anderson - landerson@shawmedia.com Woodstock police officer Adam Schraw (center) shakes hands with Chief Robert Lowen (right of Schraw) after receiving the Officer of the Year Award on Saturday during the McHenry County Chiefs of Police Association Holiday Reception at Bull Valley Golf Club. 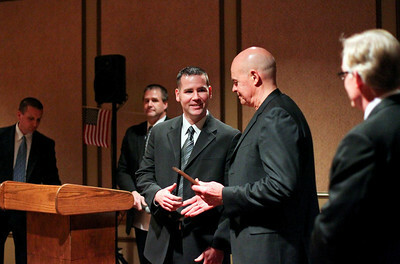 Schraw was one of several area officers nominated for the award. The Woodstock officer successfully saved the life of a baby that was choking on a hair pin last year. 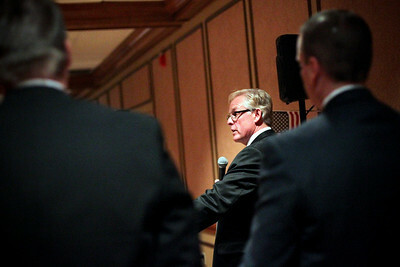 Lauren M. Anderson - landerson@shawmedia.com President of the McHenry County Chiefs of Police Association John Perkins, Huntley Chief of Police, gives the opening remarks about the McHenry County Officer of the Year Award on Saturday at the Bull Valley Golf Club in Woodstock.